The front of the house and its porch. A large Deck with extra tables and chairs to seat all. The main gathering area as seen from the dining room. 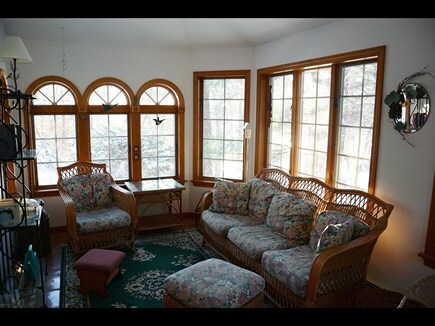 The Sunroom, with beautiful views, lies off of the Dining Room. 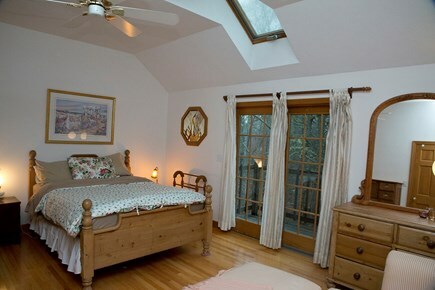 A second Master Bedroom with a private bath. 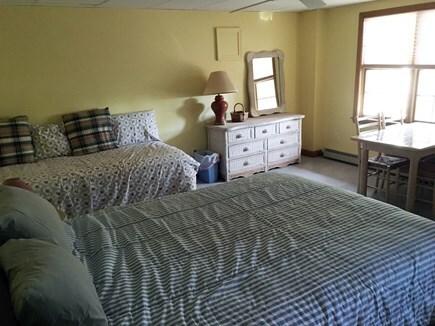 Parent-Child Room with a Single and a Queen Sized Bed. A Bedroom with two single beds and plenty of extra room. The central laundry Room with folding tables. View along our backyard conservation trail. Our Yellow Kayaks are available to qualified users. 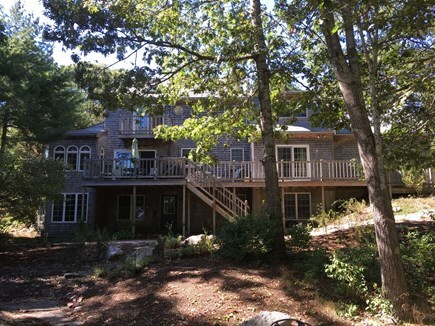 This large Cape house built on a slope with three floors showing from the back, and a beautiful cabin and porch look from the front, features two master bedrooms with private baths, an additional bedroom with a queen bed and a single bed, another bedroom with two twin beds, and a family TV/game room that has a pullout couch. A modern kitchen with a counter for seating opens to a dining room with a table that seats a large group with plenty of folding chairs. A comfortable beamed living room with central AC includes a fireplace and a side bar. The sun room has a cozy table for two with views of the bay. All rooms are large with separate seating areas, desks, and work and play areas. The third story den has cable TV, games and books, and a toy closet with blocks, dolls, dragons, and a red firetruck. Wireless Internet is available throughout the house. 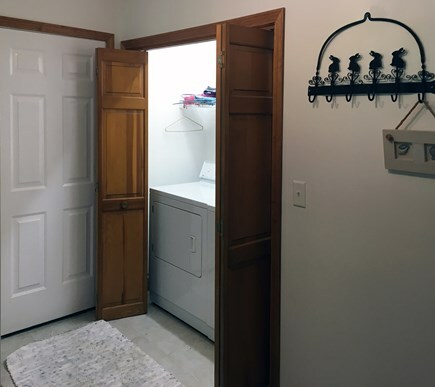 There is a large laundry room, a garage, and a back deck spanning the house length with an outdoor shower large enough for two and a gas grill. A walk through the rear yard ends by beautiful Drummer’s Cove after passing a separate stone patio with iron table and chairs. At the end of the property begins a conservation trail that follows the bay. Sitting on our front porch allows you to view the fish pond. Beautiful landscaping, woods, and walking paths. Additional availability info: 4-night stay is required for weeks June 1st and 8th. 7-night stay is required from then Thru 9/14. This is a Saturday to Saturday vacation rental. Additional pricing info: Cleaning Fee of $250. Possible MA Tax applicable for 2019, State and local taxes of 12.45% will apply. 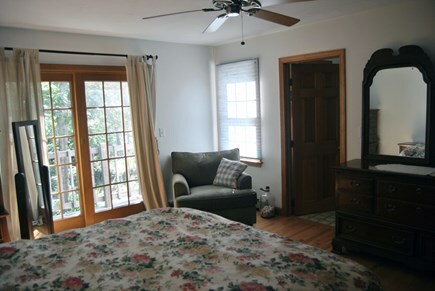 The main floor is accessible with a single porch step, and contains a queen sized bedroom with a private bath. The floor is accessible to the living room, dining room, kitchen and deck. This is great for seniors who cringe at the stairs. A comfortable spot surrounded by the wonders of nature! Staying at this lovely home felt like we were visiting friends. 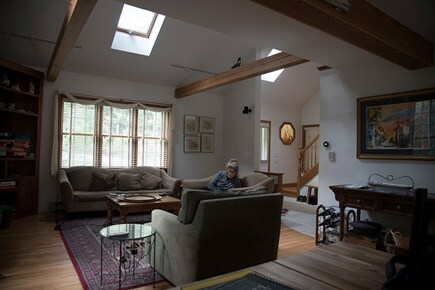 It was a perfect spot for our family gathering...featuring a wonderful great room with a big, long table for time together, plus separate spaces so we could find quiet time apart. The owners’ generous personalities came shining through. We enjoyed their kayaks and board games, used their very well equipped kitchen, borrowed their bird books to identify visitors to the patio feeder. The air conditioning kept us comfortable, as we had some very warm days. And the location away from city lights provided an extraordinary view of the night sky. The location was good for us, too. It was near some favorite Cape restaurants, with easy access to the national seashore. We spent a wonderful week here. 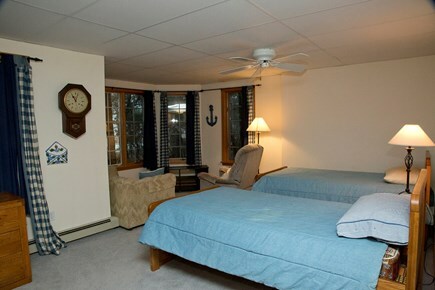 Welcoming, Bright, Ample Space, Well Stocked and Comfortable! Everything about the house made us feel at home. We loved that our dogs were welcome. We especially enjoyed the cross breezes on hot days and the spacious outdoor shower. 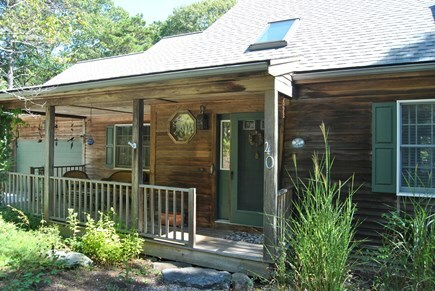 We come to Wellfleet every couple of years and usually rent an ocean front property. We really loved being close to the bay on this visit. The short walk to the marsh below the house and to the Pleasant Point beach down the road offered wonderful low tide experiences to our grandson. We hope to return in coming years. The capehouse is great:charming, super comfortable and everything works! There was ample room for 8, 3 families including 4 children under 12. The deck is great too. There are 4 gathering places. The area is super convenient to beaches, ponds, and bay, no more than 10 minutes. It was a pleasure to deal with David and Cathy. They respond within minutes! We would love to return some day. This is a wonderful property in a great location. Family thouroughly enjoyed the fishing and kayaking. Also, close access to some wonderful beaches on the Bay side. PTown was a blast as well. Can't go wrong with this property! 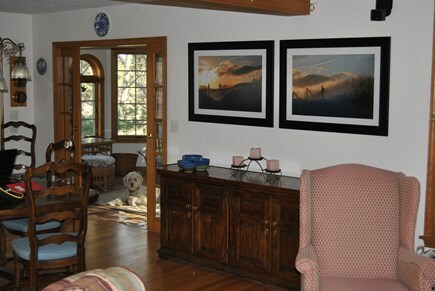 Our two families of 4 had a wonderful time at this comfortable property. We lacked for nothing - the kitchen was very well supplied - and the house's layout ensured privacy for all. The property backs up to a conservation trail, which was perfect for dog walks. The washer and dryer performed very well - there was always laundry going. Highly recommend! Great house. Accommodated 10 of us easily and with privacy for three families. Location provided easy access to beaches, ponds, stores, ... All that access and the house was on a cul de sac! No traffic! A special benefit was how accommodating the hosts were to us as first time guests. Quick and courteous response to our questions prior to arrival and even quicker when we arrived. I guess the greatest compliment is that we want to go back next year. Kind of says it all. We stayed at David's Cape house the week of the 4th of July. Everything was in tip-top shape when we arrived. 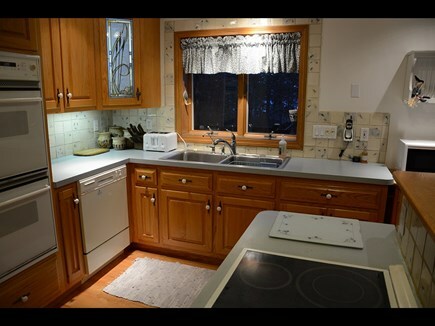 It is a lovely home and pretty much everything you could need is provided. 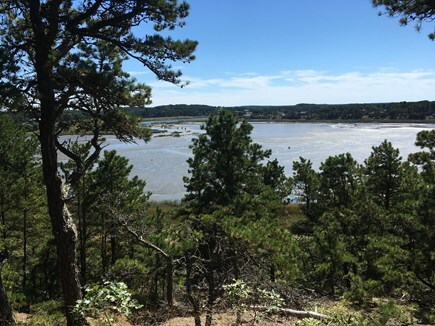 The location is convenient to ocean beaches, bay beaches, the harbor and Wellfleet Center, yet is secluded and feels off the beaten path. We were a relatively small group of 4 adults but the house is perfect for extended families with areas for congregating and areas for privacy. We only had to put on the A/C one afternoon but we were very glad to have it when it was needed! My dog and I walked the conservation trail behind the house and to Pleasant Point every day. The Cape Cod rail trail is close by and we took advantage of that. We had some terrific meals during our stay including at Pearl, Van Rensselaer, PB Boulangerie, Winslow's Tavern, and, of course, the Beachcomber. The rest of the time we lounged and grilled on the deck with a view of Drummers Cove. 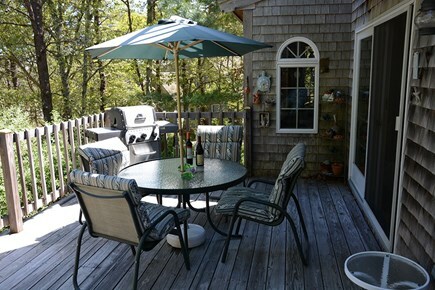 A perfectly relaxing Cape vacation in perfect Cape setting. We are looking forward to more happy times here! 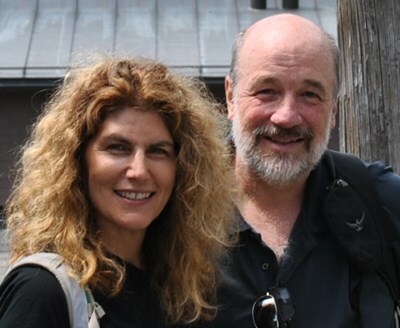 Cathy and I choose to manage our Wellfleet home, and enjoy connecting with our tenants and making their stay memorable. 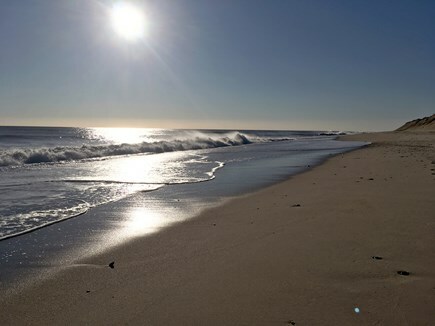 We spend as much time as we can enjoying and working on the house in the off-season when we enjoy winter walks on the beach, and the few hardy restaurants that stay open year round. Besides our love for the Cape, our home in Brooklyn, NY, offers a lively experience with our work in the creative fields and any number of our five 20-something children coming and going. I need not tell you about Wellfleet, I presume. 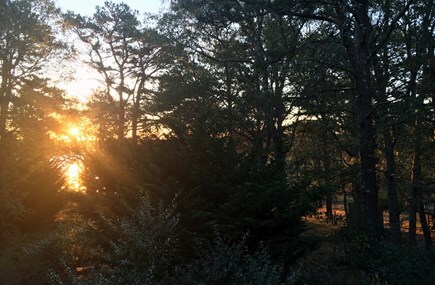 Our particular house is quiet, peaceful, and fully in the ambiance of the bay and the shifting tides, but set in a private wooded surroundings. You will find our house a home with attractive furnishings, central areas for gathering, and distant areas for privacy. 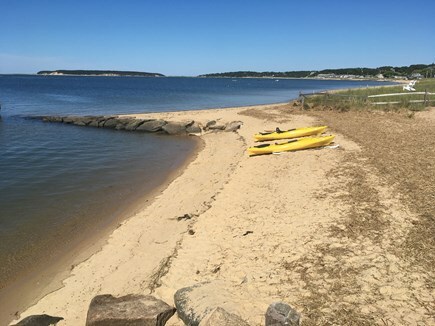 Our local Bay beach is Pleasant Point, and is great for swimming and bringing the kids. This is where we keep our Kayaks for some wonderful paddles either locally or heading down the shore to Wellfleet's main town. We are very kid friendly, and welcome your well-behaved dog. There are so many great walks from here, and a mile away is the Cape Cod Rail Trail for biking. Drummer cove at the end of our property is not only a good hike, but the perfect place to explore for crabs and watch birds. 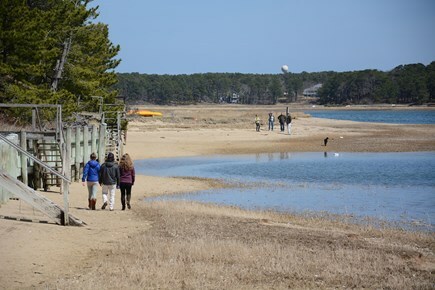 Wellfleet is a wonderful town in the Outer Cape. It is slow, quaint, and filled with galleries, restaurants, and walks along the shore. 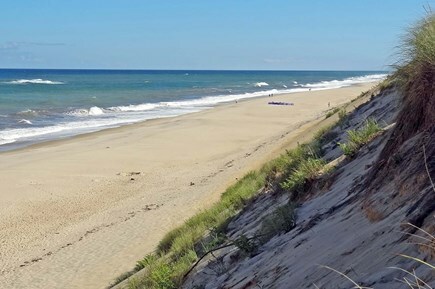 There are nature trails, dune hikes, the W.H.A.T. concert hall, yoga, lectures, farmer's markets, and events at Preservation Hall; and more than I can mention here.